The Palisade Log Cabin on the north shore of Lake Superior is located just off Highway 61, one mile northeast of Silver Bay. It is about a half mile through heavily wooded lots to the 35-year old secluded and authentic log cabin. The cabin sits on 5 acres of private land and has more than 460 feet of high rugged Lake Superior shoreline. There are incredible views to the north of the Palisade Head Cliffs. These cliffs reach 350 feet high and are a favorite of rock climbers. You can hear the waves of the lake crashing against the ledge rock cliffs just 70 feet from the cabin. The sunrises over the lake are spectacular; in the evening you might be able to view the northern lights. We installed a new geothermal heating system in October 2012 which should keep the cabin warm and cozy all winter long. Enjoy the peace and solitude of the whispering pines and birch while watching a bald eagle flying above. You can read a book or play cards/games near the cabin’s warm wood stove. Outside you can toast marshmallows at the fire pit or play horseshoes. Search for Thomsonites, agates, crystals, cobblestones, or driftwood. Go berry picking or view colorful spring wild flowers and brilliant fall foliage. Drive the Highway 61/Superior National Forest Scenic Byway and visit the beautiful Minnesota state parks nearby (see map). Hike on The Superior Hiking Trail that runs from Two Harbors to the Canadian border. Ride your bike on the Gitche Gami Bike Trail that runs along Highway 61. Snowmobile on the North Shore State Snowmobiling Trail or drive an ATV on designated ATV trails from Duluth to Grand Portage. Try cross-country skiing on the North Shore Mountain Cross Country Ski Trail. Visit Lutsen Mountains ski resort 36 miles from the cabin. In the summer you can go to Black Beach less then a mile away, and nearby beautiful sandy beaches which are part of Tettegouche State Park (ask for directions). Take a charter boat tour or fishing trip out of the Silver Bay Marina that is 3.5 miles to the southwest. If you're adventurous, you can go kayaking/canoeing in the cove. Watch for giant iron ore carriers on Lake Superior, they depart from Silver Bay and head east to Cleveland. Look for wildlife around the cabin and you may see eagle, deer, moose, bear, fox, wolf, and beaver. If you don’t feel like cooking, dine at a variety of fine nearby restaurants (Lemon Wolf, Northern Lights, The Crossings, and Cove Point Lodge in Beaver Bay; Our House in Finland; The Blue Fin in Tofte). The Palisade Log Cabin is in close proximity to all activities listed here, most within just a few miles. Most important, take time to enjoy a classic log cabin experience on the North Shore! Mark and Sarah own the cabin. They moved to the Twin Cities in 2000, and frequently spent time "up north." Sarah's parents have owned a vacation home in Silver Bay for many years. This vacation home served as a launching pad for Mark and Sarah to visit the North Shore. In 2011, Mark and Sarah purchased this cabin. They love spending time at the cabin with their two sons. The quiet cabin in the woods is always a welcome retreat. Harold and Rae Piepho manage the cabin. The Piepho's have lived on the North Shore for many years, and have extensive knowledge of the area. The north shore of Lake Superior, particularly the stretch along Highway 61 from Duluth to Grand Marais has something for everyone. Silver Bay, which is in right in the middle of this beautiful stretch, is a great place to enjoy the spectacular views of Lake Superior and to visit the many Minnesota State Parks in the area. We enjoy everything we describe on our property listing, especially the beautiful views from log cabin. The area is quiet and relaxing and also provides us with opportunities to venture out and explore a wide variety of destinations along the beautiful North Shore! Nice view of the lake up approximately 50 feet from the water. Lake itself is not accessible from the property but can be accessed nearby. Black Beach has water access for wading, kayaking, picnics. This is the only rental in the area with lake front property. There are great views overlooking Lake Superior; the sun rises straight out over the lake. Palisade Head, looking northeast along the shoreline. New Geothermal system installed October, 2012, makes cabin warm and cozy. On December 4th, 2015 We added Wi Fi now. Now we have broadband, high speed. Password given to guests. Full kitchen. Has most anything you need to cook. Lawn in front with horseshoe throwing area. Basketball hoop on driveway. Silver Bay has great courts. Outside security cameras at the front and back doors. Partial views of the decks, front yard, and back yard are within the field of view of the security cameras. If you need recreational equipment there is a recreational sports rental store in Beaver Bay for cross-country ski, snowshoeing,and snowmobiling. Rustic log cabin with all the perks!! Wonderful property and location! Very relaxing. Highly recommend. This cabin provided a wonderful opportunity to relax, share great food, watch a movie, enjoy the view, and have good conversation. It is close to a number of state parks and some good restaurants as well. We would also recommend the Lemon Wolf restaurant in Beaver Bay. We are looking forward to our next visit here! Cozy cabin right on the lake! Great location on Lake Superior. So nice that it is NOT right on highway. I would recommend this for families or couples. Keep in mind that the rooms are not truly separate but share an open ceiling. Loved the wood stove. We had a wonderful time at the Palisade Log Cabin! 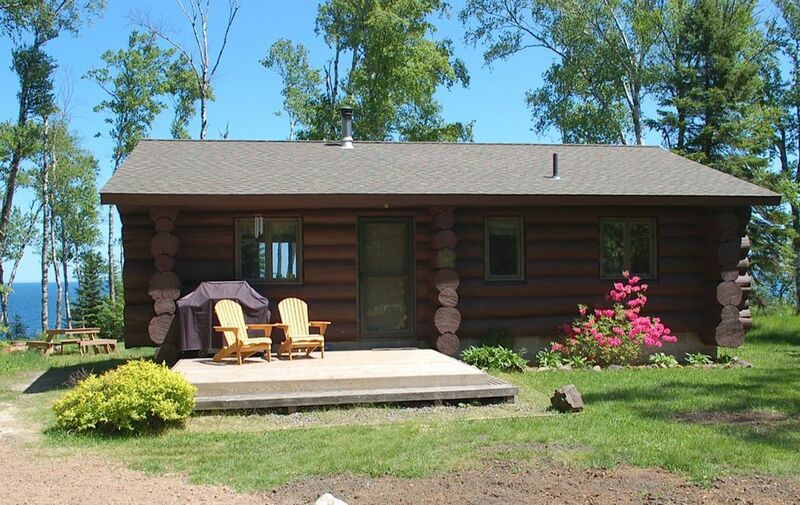 The cabin is located in a great spot to take enjoy many adventures on the North Shore. We also loved the cabin itself, it was clean, cozy and had great views of Lake Superior. Would definitely recommend staying here! We can’t wait to come back. Cozy, quiet cabin in a picturesque setting. Being within a short drive to Gooseberry, Palisade Head, Tettegouche, George Crosby Manitou, and Lutsen makes it a great location for a north shore getaway any time of year. Highly recommend this cabin. Only heads up would be to possibly bring your own drinking water. The reverse osmosis system they have works well, but the water still has a bit of a salty taste to it that some may not like. The tranquility of this place and the view from the bedroom is heaven on earth! Silver Bay is midway between Duluth (55 miles to the southwest) and Grand Marais (55 miles to the northeast). It is a great location to see all the beauty of the North Shore of Lake Superior. Minnesota state parks nearby include Gooseberry Falls, Split Rock Light House, Tettegouche, George Crosby Manitou, and Temperance River. The Palisade Head just northwest offers great views of the lake. Also nearby is the Superior National Forest and the Superior Hiking Trail. Two pet maximum. Pets must be crated when unattended. KEEP CLOSE WATCH ON PETS. BEWARE OF NEIGHBOR DOG AND WILDLIFE IN THE AREA. Check in: 3:00 p.m. Check out: 11:00 a.m.